Watch Ginger Zee's swim with sharks in live 360-degree virtual reality. "Good Morning America"'s Ginger Zee is getting up close and personal with sharks in the Bahamas today -- and she's taking viewers with her for an underwater experience in live virtual reality. "GMA" is broadcasting live from Zee's dive with Caribbean reef sharks on a wreck called the "Ray of Hope" off of the Bahamas. The live underwater 360-degree virtual reality camera allows viewers to experience the adventure as Zee descends into the water with expert trainers and encounters the sharks. Watch the video below or click here to experience the dive in VR. Turn your device or drag your finger or mouse to move around within the video and explore. Zee was guided 45 feet underwater on to the "Ray of Hope" shipwreck by PADI master scuba diver Liz Parkinson, who was able to put one shark into what is called tonic immobility. The temporary state of paralysis, which Parkinson achieved by tickling part of the shark's snout, allowed Ginger to get up close and personal with the wild predator. "I have a fin in my hands," she said. "It’s so soft and gorgeous and so strong. You can feel the strength because every single part of a shark is working. You can feel the muscle and the cartilage." Zee was surrounded in the water by mostly female sharks, which are more prevalent in the Bahamas, and a large population of pregnant sharks, since it is mating season. (ABC News) "Good Morning America" co-anchor Ginger Zee dives with reef sharks on a wreck called the "Ray of Hope" off of the Bahamas. "All of their body is cartilage except for their jaw and teeth so that they can whip around in the ocean so quickly," she said of the sharks. Parkinson described sharks as "advocates for the ocean" and said the goal of dives like the one seen today on "GMA" is to put a spotlight on what is being done to protect sharks. "Shark conservation is super important to the ecology of the underwater marine life anywhere in the world," she said. "In the Bahamas, the government made the Bahamas one of the world’s largest shark sanctuaries so sharks are protected throughout our country. There is no buying or selling of any shark products." There she is! 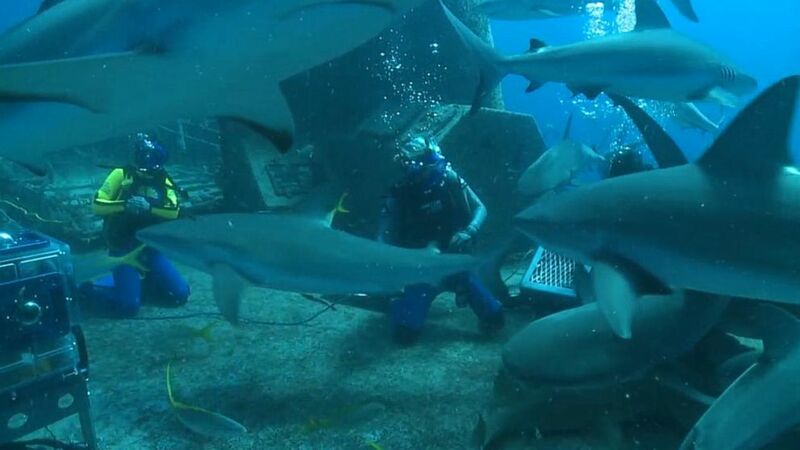 @Ginger_Zee is getting ready to swim w/sharks. "They are the apex predator in the ocean," Parkinson added. "It is super important to keep this natural circle of life going so that it balances out the ecosystem." The Bahamas was declared a shark sanctuary in 2011, prohibiting commercial fishing from catching sharks in its territorial waters. Caribbean reef sharks are the most common type of shark seen in the country. They primarily inhabit shallow reef sites and range in size from 3 feet to upward of 9 feet. They are considered the third most aggressive shark that scuba divers encounter. The Caribbean reef shark may fall prey to larger sharks like the bull shark and the tiger shark.